Imagine a world where everyone knows what a craniofacial syndrome is; a world where a child with a craniofacial condition is able to play at the park without getting stared at or bullied. Can you imagine a world where no one is judged for what they look like on the outside? Where everyone is accepted for who they are on the inside? That would be a pretty amazing world, wouldn't it? This summer I had the pleasure of working in a dining hall for the 2013 Canada Games. The place was filled with athletes. Among these athletes, I noticed one of them had Down syndrome. She was a very sweet girl who always came in with a smile on her face. What I also noticed was that no one stared at her or made rude comments. She just blended in with the crowd. Unfortunately, for me, this was not the case. Throughout each day, I would notice people staring at me as I worked. Even when I talked to some of them, I could tell by the way they were looking at me, that they were trying to make sense of my facial differences. I began to wonder, why did they stare at me, but not at the other girl too? Suddenly, it dawned on me; familiarity. It is safe to say that a majority of the population is aware of Down syndrome. They teach us about it in elementary school and we also even see people with Down syndrome who are actors in TV shows and movies! This made me realize that the reason the athletes did not stare at that girl, is because they all knew about Down syndrome and so it was no big deal to them. When people are faced with someone that looks unfamiliar and different, it makes them curious and more likely to stare and sometimes even judge. What I went through at work, got me even more excited for September to arrive. This month means a lot to me because it is our chance to educate others. The more we educate, the more we are able to wipe out ignorance. If we educate others about facial differences, then they’ll be more understanding and hopefully more accepting. Knowledge is power! Every time I meet someone new and tell them I was born with Pfeiffer syndrome, I always get the same response: “Pfeiffer syndrome? I've never heard of that! What is it?” My hope is that one day; people will automatically know and recognize what a craniofacial syndrome is. Therefore, if they see someone that looks different, they'll shrug it off like it's no big deal. How is this possible? By spreading awareness! 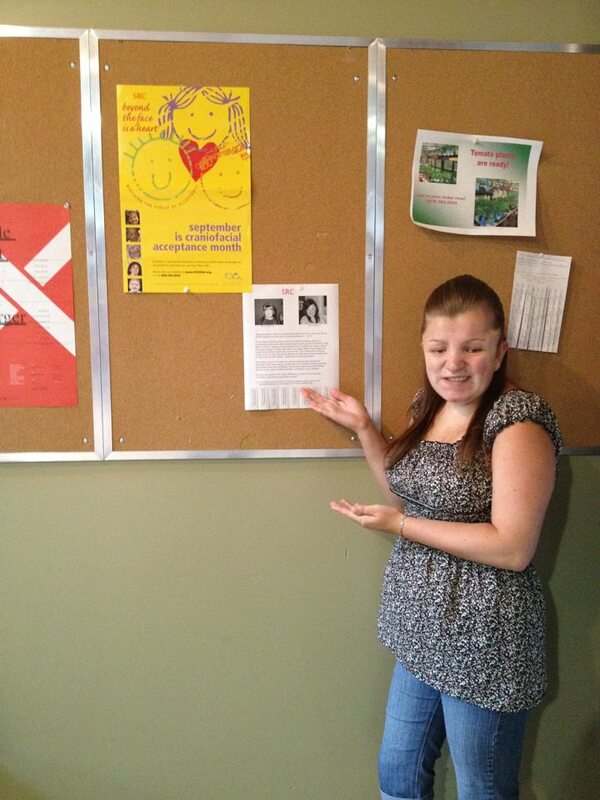 For the past 2 years during Craniofacial Acceptance Month, I have put up CCA posters all around my university campus. This year was no exception. As I started putting up the posters, I got that feeling of excitement. When I walk to class and see all the yellow everywhere, it makes me proud to be a part of CCA and all that it stands for. I have always believed that we should never judge a book its cover. It's what's on the inside that matters! I always believed as well NEVER JUDGE A BOOK BY IT'S COVER most of the time your disappointed. But once you read between the pages/lines you get more than you ever dreamed you could get. Good luck to you Sabrina. Sabrina, your blogs always lift me up. You are exactly right -- education and awareness are the pillars for acceptance. You're an inspiration to me! xo!